Boxes can range in price from just a few dollars to $150 and up, so finding budget options can sometimes be a challenge. What’s Inside: 5+ beauty items from brands Walmart carries. You can expect a mix of sample size and a few full-size products. Usually, there are a few coupons, too! Learn More: Check out our Walmart Beauty Box Reviews + Walmart Beauty Box Spoilers to learn more about what to expect from this subscription box! COUPON: Use code MSA50 to get your first month for just $1.75! What’s Inside: EarFleek is a new monthly subscription box for earrings that is only $3.49 a month! They promise the latest designs and trends, 100% nickel-free, with FREE US shipping! Choose from Young At Heart, Minimalist But Groovy, or Boho Babe All The Way styles. You’ll get one pair each month in your selected style. Learn More: Check out our EarFleek reviews to see what you can expect from this subscription! Price: Free, just pay $5 shipping. What’s Inside: Walmart Baby Box ($5) is a free, one-time purchase box: You’ll pay just $5 shipping to receive a box of baby samples and coupons. Customize your box by due date, gender, and type of box (Prenatal, Newborn, or Toddler) to receive product samples that work for you and your family. If you sign up for the Prenatal box, they’ll automatically send you Newborn and Toddler boxes when your child reaches those milestones. How to Join: Sign up for the Walmart Baby Box here! Regular Price: Razors range from $1 to $9 a month depending on quality and number of blades. What’s Inside: Dollar Shave Club is a monthly razor blade subscription service! Choose which razor you prefer and add on optional grooming products like shave cream, hair products, and even oral care to customize your refills just for you. Learn More: Check out our Dollar Shave Club reviews to see what you can expect. Free Trial: Get your first month for free, no coupon required, just use this link! How it Works: Gwynnie Bee is a clothing rental subscription service for women sizes 0-32. (They were previously only for plus sizes but have since expanded.) You set up a virtual closet of the clothing items you love, and Gwynnie Bee will send you items from your list– choose to receive from 1 to 10 items at once. Keep them as long as you want, and buy them for a discount if you can’t let them go! Gwynnie Bee covers all shipping and cleaning costs. Learn More: Check out our Gwynnie Bee reviews to learn more about this clothing rental service. Trial Offer: Use this link to get your first 4-snack sampler box free! Just pay $1 shipping. What’s Inside: Graze is a mini-snack subscription box that sends a customized selection of treats weekly, bi-weekly, or monthly. They offer over 100 different snacks that you can rate online, which, over time, helps tailor your subscription to your particular snacking preferences. Learn More: Check out all of our Graze reviews to see what you can expect from this subscription. 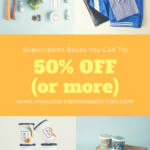 Trial Offer: Use coupon code mysubaddictxoxo to get your first month for FREE! What you’ll get: Rocksbox is a monthly subscription box for jewelry rental. Receive 3 pieces of hand-selected jewelry in every box, including an item from your wishlist. Wear them as long as you like, and then return them in a pre-paid shipping envelope to swap them out for a new set. Members also receive “Shine Credit” to purchase items at a discount if they want to keep them forever. Learn More: Check out our Rocksbox Reviews to learn more about this subscription! Regular Price: $9.78 for shipping, and pay only for what you keep; Items range from $10-$25 each. The $9.78 shipping fee is applied toward any item you decide to keep. Try Risk Free: Use referral code NADINE to waive shipping fees on your first box and try this box 100% free! Pay only for what you keep. How it Works: Nadine West is a subscription styling service for women sizes Small to 3X. Subscribers fill out a style quiz and are sent an outfit (2-4 items, usually 1 apparel item plus accessories) every month based on their style preferences. There is no styling fee, but there is a shipping fee ($9.78) that is credited toward the cost of anything you keep. Their items are priced lower than other styling services, ranging from $10 – $25 per piece. Learn More: Check out our Nadine West reviews to see what you can expect from this subscription box! What’s Inside: Hubble is a monthly subscription box for affordable, daily contacts (regularly $30/month for 30 pairs). You will need an existing and current contact lens prescription to sign up. Learn More: Check out our Hubble Contact Lenses Review to see what to expect when you sign up! Trial Offer: Use this link to get your first filter free, including free shipping! How It Works: FilterEasy is a furnace and air filter subscription service that ensures you always have clean air in your home. Choose your size and whether to receive deliveries every 1, 2, or 3 months, and you’ll never forget to change your filters again! Trial Offer: Get your first month of Curology for free, no coupon needed! How it Works: Curology is a unique and totally personalized prescription skincare subscription service that targets acne and pairs you with a licensed dermatologist and sends you prescription medication every month or every other month. Learn More: Check out our Curology Reviews to learn more about what to expect from this box! Why is everything always sold out even when you try to subscribe on the first of every month? Sorry, we’ve removed all boxes that aren’t always available. Everything on this list is now available to buy at any time! Sorry, that link has been removed. Dollar Shave Club is available for $5, though. Hope that helps! Those Squix boxes have been sold out for a month. I keep trying. If they sell out, they’re typically available again on the 1st of each month!